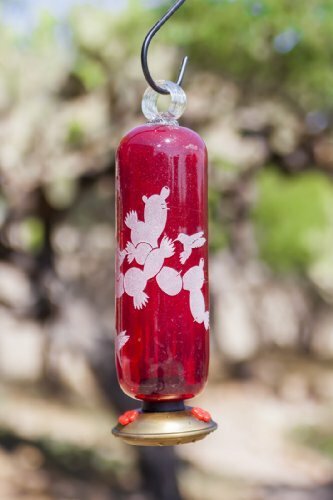 Add some color and a festive air to your backyard this season, with this brilliant hand blown glass hummingbird feeder!! Alfredo García-Lucio, Creative Director at Parasol Gardens, created this wonderful design of hummingbirds feeding from prickly pear cactus for the Festival Internacional del Colibrí, the international hummingbird festival in San Miguel de Allende. 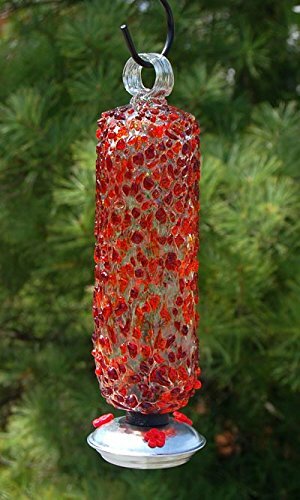 This beautiful feeder comes in several colors to really enhance your backyard hummer watching. This feeder features Parasol's Dripless Gondola stopper in antiqued brass. Comes with a tag with instructions and the nectar recipe. 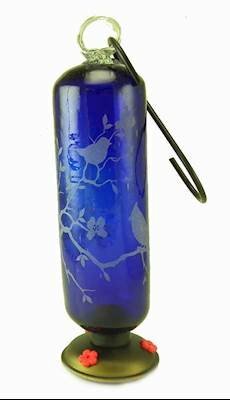 Parasol Filigree hummingbird feeder in the Twigs design in Blue. 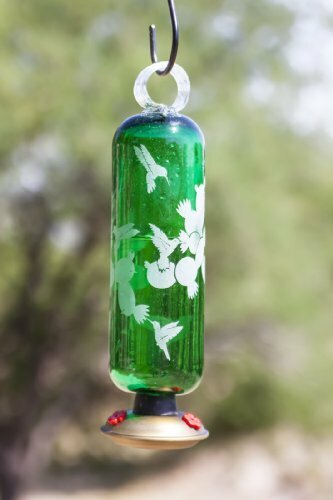 This item is made with recycled glass and is non acid etched with twigs and hummingbirds. 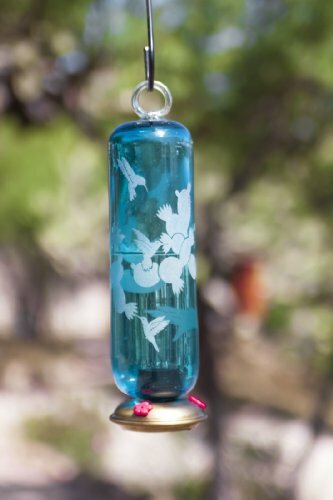 It holds 16-ounce of hummingbird nectar and measures 3 by 11. It includes the dripless gondola. Instructions are on the hangtag. This gorgeous feeder will add both beauty and function to your garden! Parasol Filigree Hummingbird feeder in the Barbershop design. 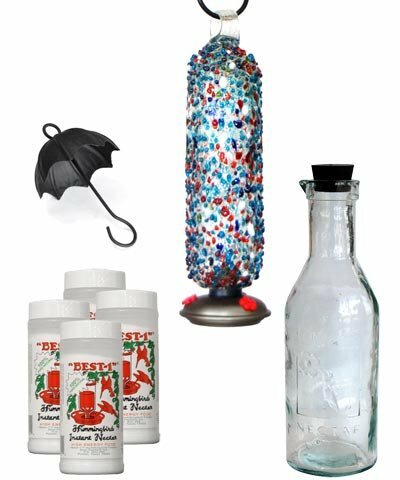 This item is made with recycled glass in the red and blue spiral pole design. 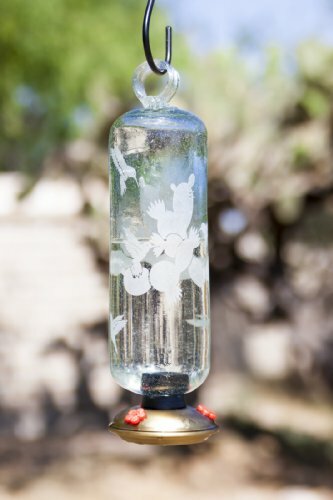 It holds 16-ounce of hummingbird nectar and measures 3 by 11. It includes the dripless gondola. Instructions are on the hangtag. The gorgeous feeder will add beauty as well as function to your garden! FILIGREE BIRD GARDEN BLUE HUMMINGBIRD FEEDER by Parasol The glass feeder is about 10" tall. The bottom section comes off allowing the filling of the feeder. Comes complete with the metal hanger shown. 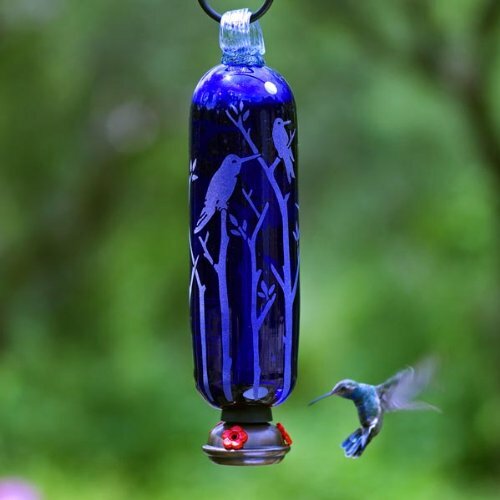 Copyright © Wholesalion.com 2019 - The Best Prices On Filigree Hummingbird Feeder Online.